Hi there and welcome to the eP Blog today! Michelle here and I'm your hostess for today. I've been working on this piece off and on for a few days and I decided that it needed to be framed. I'm kind of liking it. It's my service project for this week and will be found by an unsuspecting friend on her doorstep when she gets home from work. Just a little bouquet of flowers to brighten her day. 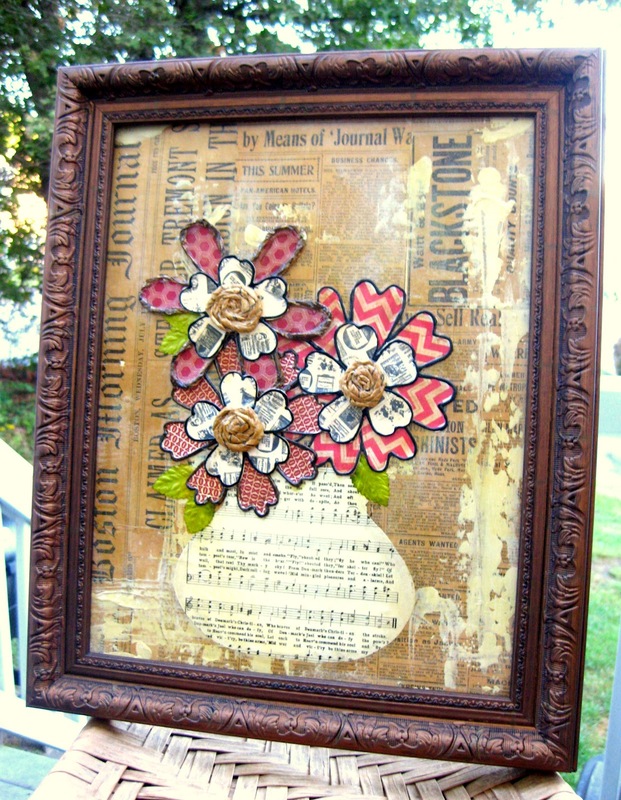 I took an 11x14" canvas board and covered it with with pieces from an old 1901 Boston Morning Journal newspaper. 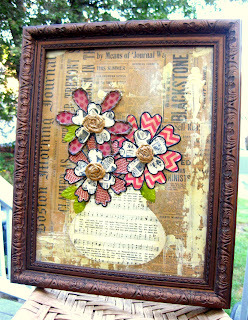 Then I used a cream colored paint mixed with some modeling paste for texture. I used Love Me from My Mind's Eye for the flowers and did some fussy cutting. 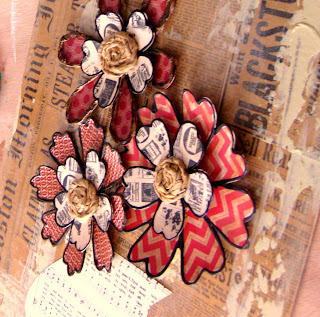 The edges of the flowers are trimmed with Claudine Hellmuth Black Paint. I LOVE using her paints in the mini bottles. Super easy to use and with way less mess. For the centers of the flowers I used a sewing pattern and just twirled it until it created a circular pattern. I used Inksentias Glue N' Seal in Gloss on the flowers and the vase to have them pop off the canvas and kept the background in the matte. I took a deep breath and then did an all over stain using Tim Holz Distress Stain in Brushed Coururoy. Thanks for stopping in today. I'm off to deliver my friend's bouquet of flowers! I love it! It's a wonderful art piece. I'm sure your friend is going to absolutely love it! Absolutely stunning. She must be a really, really good friend.